It was once said that Avengers: Infinity War was to be the most ambitious crossover event in history. That was, of course, before Thanos showed up in Fortnite, in a move which unceremoniously robbed Marvel’s magnum opus of its title. Sadly, this rollercoaster ride appears to be taking its toll on some of those the crossover concerns, most notably Thanos himself (or Josh Brolin, as we hear he prefers to be called). If you haven’t seen the Fortnite/Avengers crossover yet, it’s reasonably simple. Players can queue up for a limited time mode named ‘Infinity Gauntlet’. The mode involves the aforementioned power mitten dropping from the sky onto Fortnite’s map. Any player who picks it up has the power of the Infinity Stones bestowed upon them, giving them significant in-game power-ups but robbing them of the ability to build structures or wield conventional weapons. 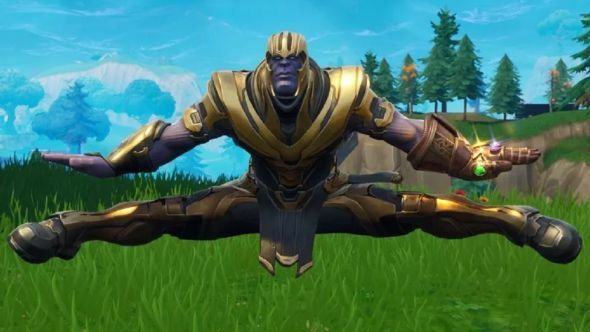 But while Thanos might be much more powerful than your conventional Fortnite character, he’s still bound by the game’s engine, meaning, among other things, that he can pull off some of the game’s most impressive dance moves. In an interview with IGN, however, actor Josh Brolin, who plays Thanos in Infinity War, didn’t seem convinced by the Mad Titan’s mad moves. Whether or not Brolin enjoyed them, it looks like Thanos’ dance moves are here to stay, for a little while at least – Infinity Gauntlet is available to play now, alongside the return of the 50v50 Limited Time Mode.